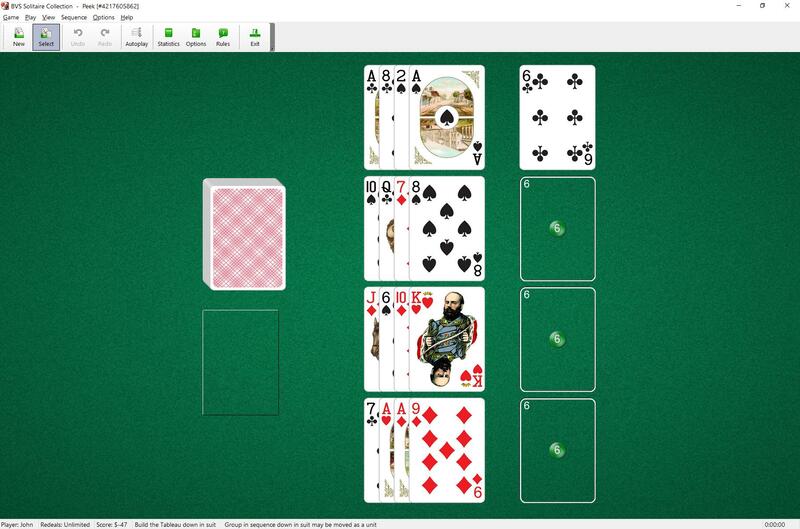 Peek Solitaire uses one deck (52 cards). You have 4 tableau piles with 4 cards in each pile. All cards are face up. You also have 4 foundations. The first card dealt from the stock pile is the starter card of the foundation. The three other cards of the same rank are moved to the foundations during play. To build the foundations in suit regardless of order. 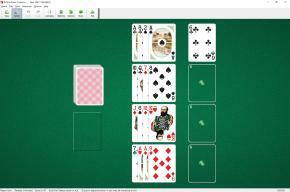 The top cards of tableau piles are available to play on the foundations. Any card of the same suit may be built on the first foundation as soon as it becomes available. On each lower foundation, a card can be moved only if a card of the same rank has been built on the foundation above. You cannot move cards from one tableau pile to another one. If, during play, any closed cards become the top card of a stack, it turns over. When you have made all the moves initially available, begin turning over cards from the stock pile. 3 cards at a time are turned over from the stock pile. You can move cards from the stock pile to the foundations according to the rules above. You can turn over the stock pile as many times as you wish. This game is an open variation of Osmosis.